Normandy Life: Did you ever have one of those days? Did you ever have one of those days when things just don't go your way? I'm not talking about a really Bad day (with a capital B) just "stuff" you could have done without? I spent over an hour looking high and low through the house for my camera because there were pix on there that I needed to tweak before completing some blog posts. Looking for it in places I knew it couldn't possibly be (under the dog bed; in the fridge) but looking anyway because it just wasn't to be found anywhere else. Eventually I found it quietly sitting in a decorative Quimper bowl on a window sill where I had placed it earlier, before getting fresh sheets and pillowcases from the linen cupboard. Then when I finally went up to switch on my PC I discovered that the Velux window in the roof (my room's in the attic) had been left open overnight. That meant that the rain which had been bucketing down all morning (literally bouncing off the pavement outside) had totally soaked everything on my desk beneath said Velux window, including above mentioned PC! Mouse, mouse mat, mug mat, blue cotton throw from Ikea that covers my table, note pads, pens, pencils, leather office chair, books, camera case (yes, I know, be grateful that the camera wasn't in it's case at the time! ), dish of sweets and a teddy bear companion not to mention the rug beneath the desk and chair. 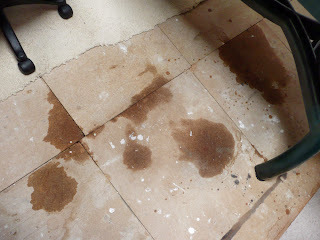 The rain went through the rug and into the floor tiles. After clearing up the mess and taking the rug down to the garage to dry out I gingerly powered up my laptop and all seemed well. That is until I began to write this blog post, then weird things began to happen. The number seven started to appear in the text 7777777777, and my Ashampoo Photo Commander went haywire. I called the Senior Partner in for a consult, he knows a thing or two about computers. His advice, use a hair dryer! Strange but true. So that's what I did and after 15 minutes powered up again. Still not right, so I turned it off and left it overnight to dry out and fingers crossed it seems to be o.k. now. Has your computer ever gone on the blink? It's a scary feeling to think that you might not be able to access all your "stuff" ever again. I've learned my lesson, and will be making sure I back up to the desk top more often in the future. Looking forward to a better day today, and wishing you the same! Sometimes we just have one of those days!!! Glad your computer seems to be okay! And yes, we lost everything on one computer -- got H1N1 virus (or at least that is what we thought -- LOL) and so our next computer was a Mac -- no problems! Glad everything appears to be okay! My friend here is always preaching "backup". Which we do automatically now. Hope today is a better one. Get those photos into a post. But, Maggie, rain? What is that? Going to backup right now. So sorry you had one of those days and I hope the rest of the week is very calm. Yep, going to back up right now! Water and anything electronic (especially cell phones) do not mix, water tends to kill them immediately! 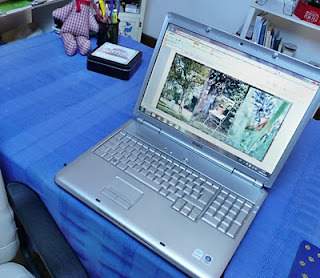 I'm amazed, and sometimes puzzled, to think about how much I rely on being connected to the world through my computer. Could we ever go back to the way things used to be? What an adjustment! I'll remember the hairdryer trick. So glad everything seems to be working well. Those days are frustrating, indeed. Oh my goodness, you have had a bad day! Hope everything is OK with the computer now. I have had cell phones get wet, but never a computer. Drying them out as quickly as possible and then waiting a couple of days seems to be the answer every time. Oh my goodness, rain on your computer?????? My husband would faint (after I fainted). I hope all is well now and learning about the hair dryer is good. And yes, I've certainly suffered through days like yours. P.S. I find myself putting my camera where I KNOW I won't forget it, but then I always forget it. Yikes. Meh! I hate those annoying days where things go wrong!!! I am so sorry, but the good thing is your computer is working. Although I do not have those days often, it seems like the bad things happen in threes on those days! Those days must be endured from time to time - they just underline the beauty of all the other days. It's pretty awful to think of losing all the great 'stuff' one has collected on the computer! Just began scrolling down through your comments and want to say this to Martha: Beware! Macs are increasingly subject to viruses!!! I just had a virus scan and barrier installed....really: take note! But oh Maggie: what a terrible day for you. Yes, I run a backup "Time Machine" on my Mac always. Good luck! Gosh Maggie, know that was a scare - losing everything on the computer is something we all dread, and still we don't take time to backup!!! As for spills - a nice glass of cabernet flooding my MacBook keyboard was a lesson to me - luckily it dried up in there somehow and no problems afterward!